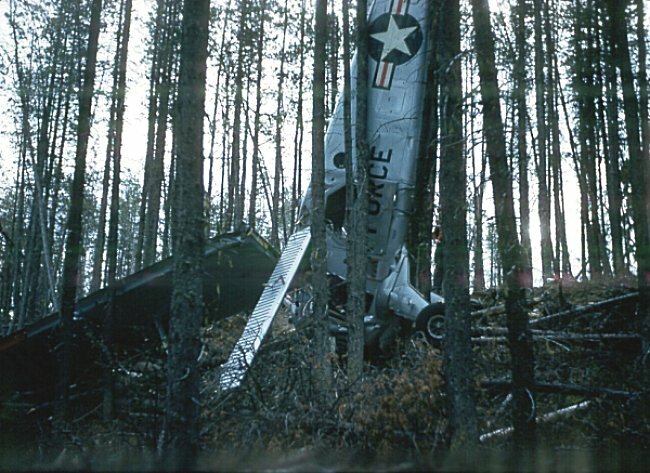 Pinetree Line note - I first heard of this accident when I was typing the official USAF Narrative Reports for Saskatoon Mountain Air Station – period 1 Oct 58 to 31 Dec 58. I was hoping to obtain some additional detail – and I ultimately proceeded to our local library to check the available microfilm. I was NOT successful. A pure case of luck brought Pat Chenier to the web site. I "begged a little"; and she took on the request with gusto. Pat ended up spending a number of hours searching back issues of the Grand Prairie Herald Tribune which are stored on microfiche and located at the Grande Prairie Public Library. She was successful – and a transcript of the article which was printed in the local paper is provided below. 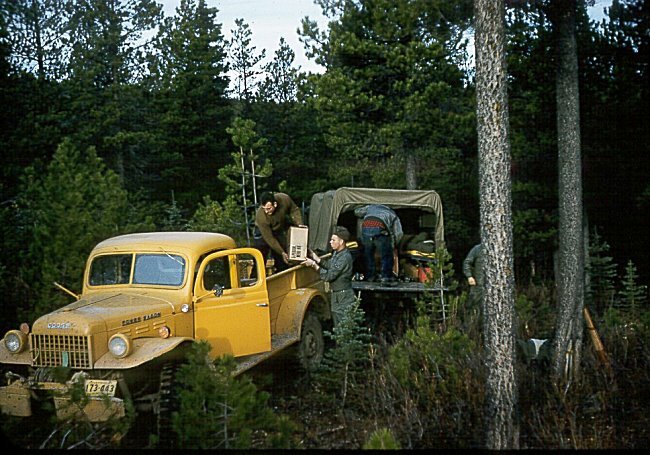 My thanks go to Pat – as she continues her crusade to provide additional material pertaining to the Radar Station which was located on Saskatoon Mountain. On October 17, 1958 a Beaver Aircraft belonging to the USAF took off from Grande Prairie, Alberta enroute to Edmonton, for a routine maintenance inspection. 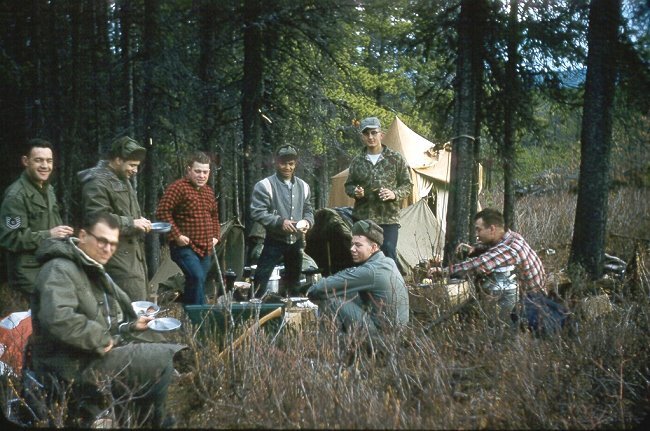 On board were Captain William Varns, Captain Walter Brown, Lieutenant Lawrence Anderson and Sergeant Jackie Herth from the 919th Squadron, Saskatoon Mountain Air Squadron, Beaverlodge, Alberta, Canada. Two hunters were reported missing in the area of Nose Mountain, south of Grande Prairie, and the flight was side-tracked to search for them. The hunters were spotted and the crew radioed that they were going down closer to enable them to drop a note to the hunters. That was the last word from them. A civilian plane with a USAF Sergeant aboard was dispatched from the Grande Prairie airport to search for the missing aircraft. They located it but had no radio so had to return to Grande Prairie to report. Meanwhile an RCAF Search and Rescue plane from Namao was dispatched. 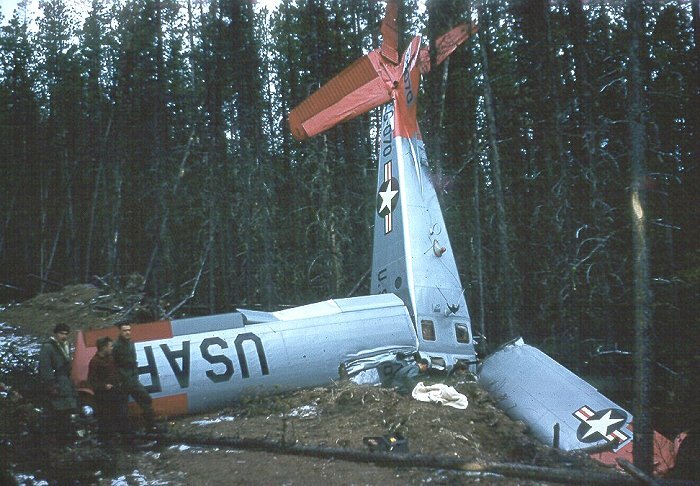 When they located the crash, they radioed in the location and continued to circle until a RCAF helicopter from Dawson Creek, BC reached the site. 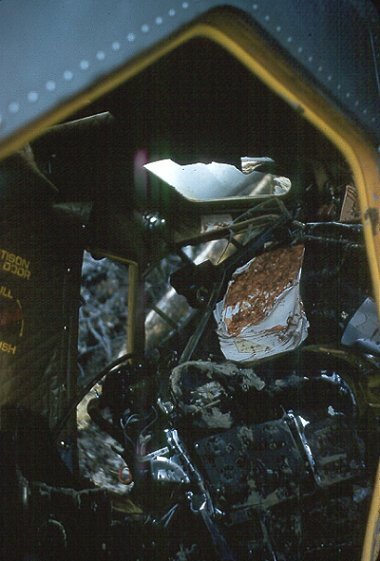 The helicopter picked up the injured airmen and radioed back that "One of the chaps didn't make it." The injured were air-lifted to Grande Prairie and transported by ambulance to the hospital in Beaverlodge. The hunters stayed at the crash site overnight and were air-lifted out early Saturday when the helicopter returned to fetch the body of Captain William Varns. The two hunters were praised for their help in assisting the injured airmen. The following email message was received from Pat Chenier on 23 March 2001 - "I received an interesting phone call this afternoon. I don't know if I told you, but I had put a Letter to the Editor in the Beaverlodge Advertiser letting everyone know about the latest pictures on the site for Beaverlodge. 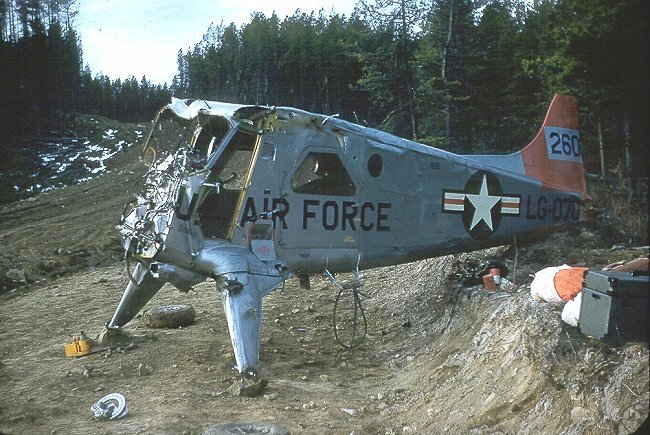 I asked if anyone knew if the wreckage of that plane was still on Nose Mountain. Today I got my answer in the form of a long distance call from Calgary, Alberta. It was from the widow of Captain Varns, the officer that was killed in the crash. According to her, because so many planes were reporting a downed plane on the mountain, the Americans sent a crew to bury the wreckage". I just viewed the pictures of my Grandfather's crash site. Thank you for making this web site. I feel proud to know that my Grandfather was not forgotten and it's neat to see pictures of people that knew him. The plane crash happened long before I was born so I only know him through others memories. Thank you for sharing them!! 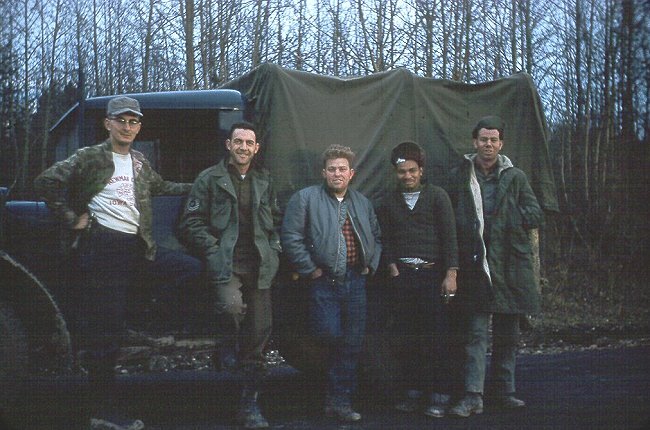 Our special thanks go to Joseph Blum who served as the OIC of the recovery team in 1958 - and has made these photos available to the Pinetree Line web site. 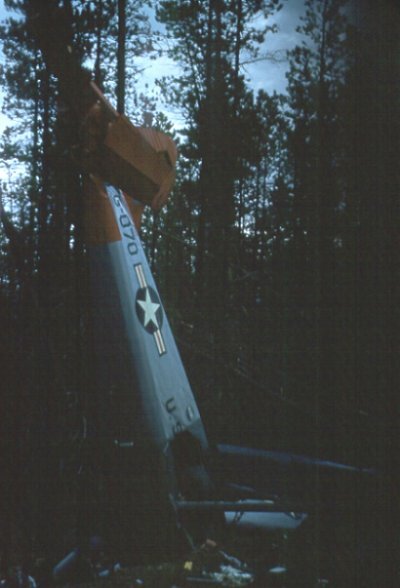 The photos can truly be considered as one of a kind, and it is questionable whether there are any other photos of the L-20A crash in existence. 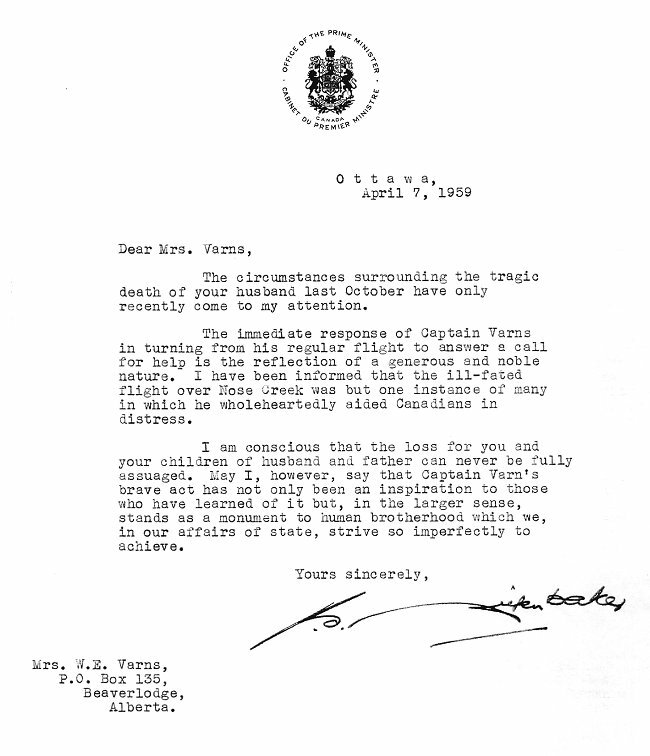 Letter from Prime Minister of Canada - 7 April 1959. 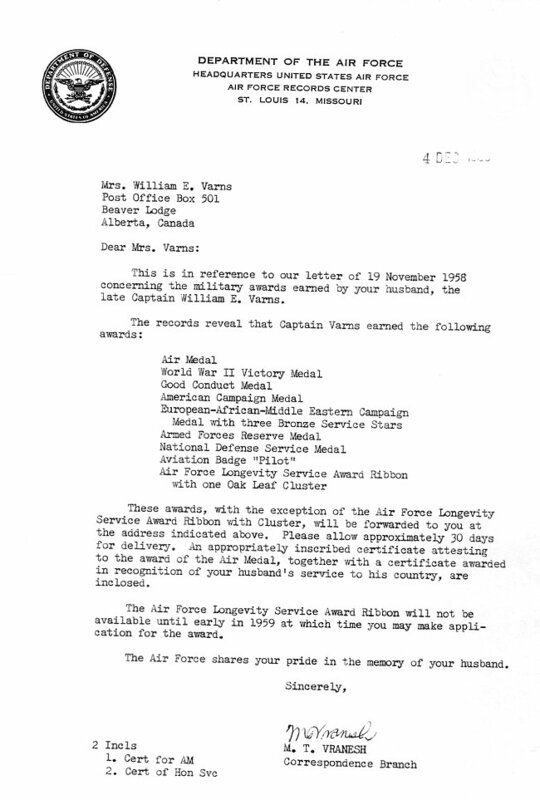 Letter from Department of the Air Force - 4 December 1958. 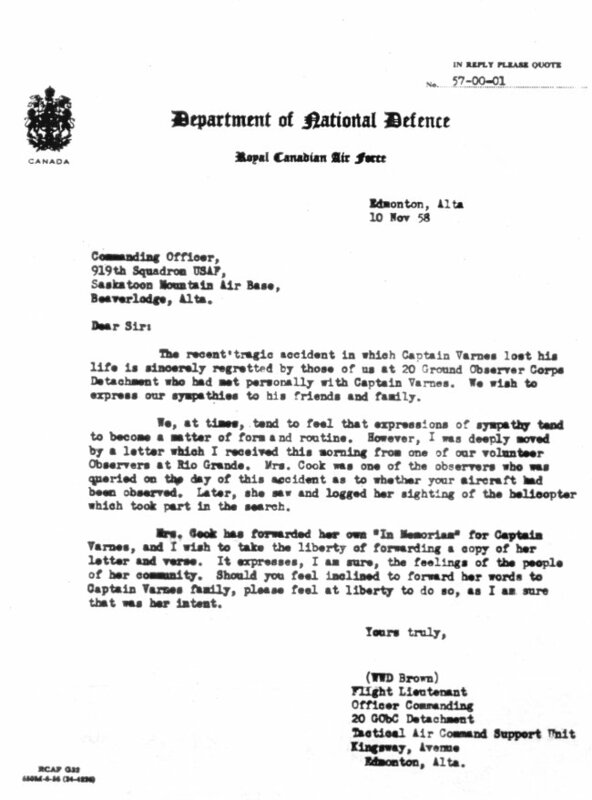 Letter from Ground Observor Corps - 10 November 1958. 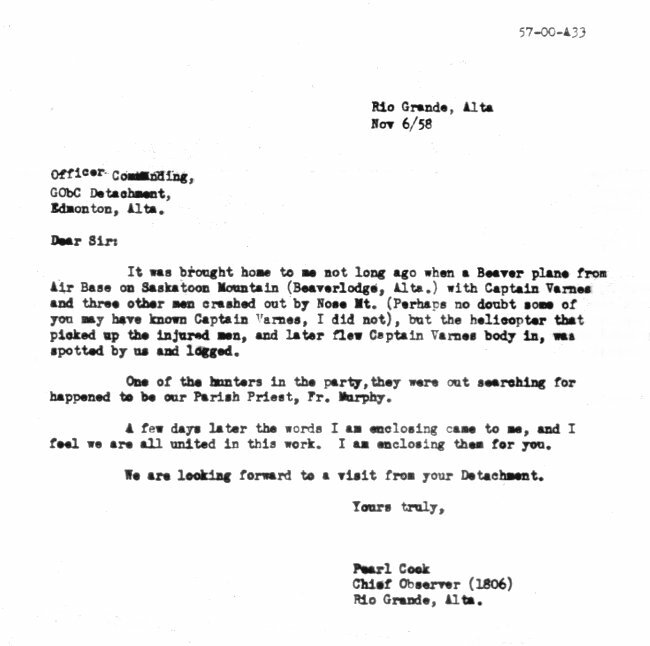 Letter from Ground Observor Corps - 6 November 1958. 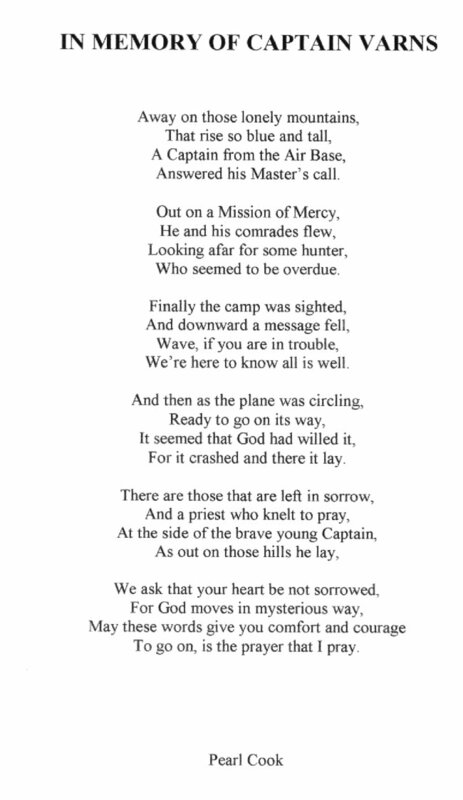 Poem from Ground Observor Corps - 6 November 1958. Arrival back at the 919th after a five day recovery operation - 25 October 1958. Non salvaged airframe was abandoned in place - 24 October 1958. 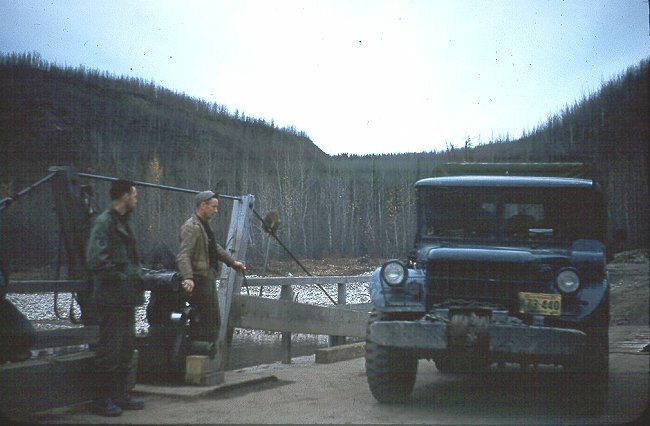 Fording Nose Creek on return from the crash site - 24 October 1958. Non salvaged airframe was abandoned in place - 23 October 1958. 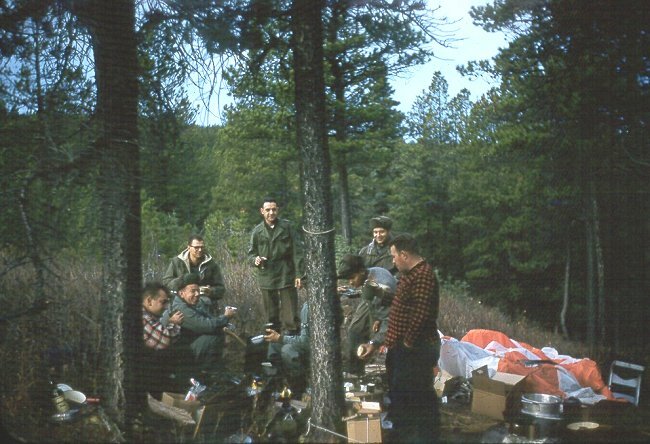 Recovery party securing recivered aircraft equipment (radios etc) - 21 October 1958. Recovery team departing for Nose Mountain crash scene of L-20A aircraft - 20 October 1958. 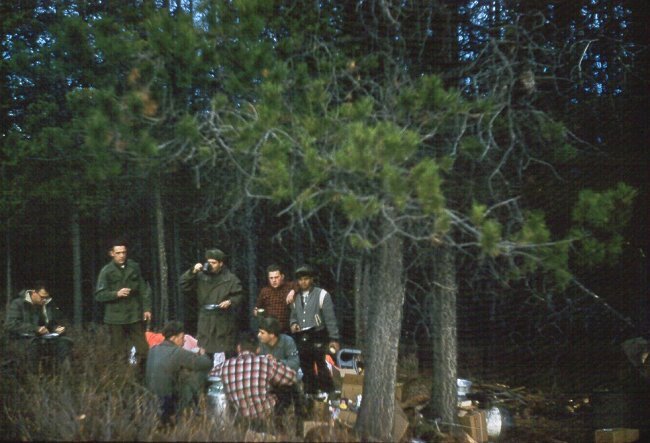 Recovery team departing for Nose Mountain - 20 October 1958. Recovery team departing for Nose Mountain. T/Sgt Thomas T Stuart (NCOIC) far left, and Lt. Blum (OIC) standing in front of the tent - 20 October 1958. 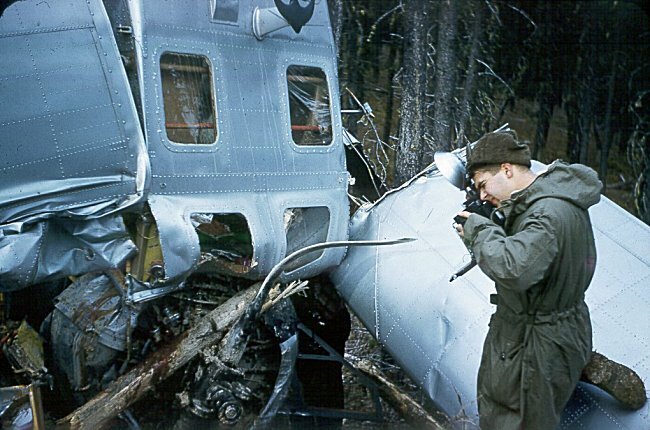 Aircraft crash scene - 20 October 1958. 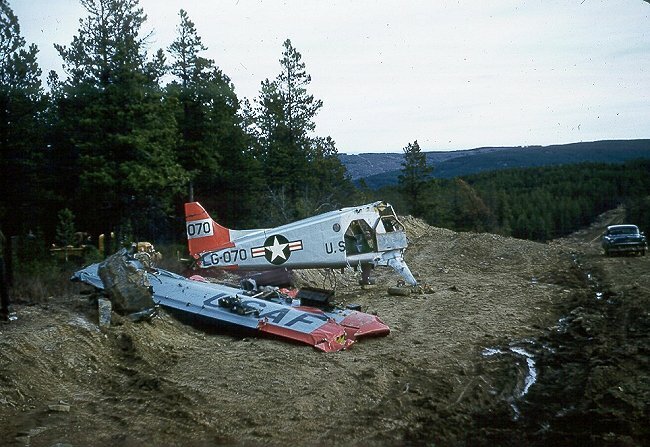 Aircraft crash scene. Lt Lawrence L Anderson was in the left seat flying as the pilot and Captain William E Varns, co-pilot and aircraft commander, was in the right seat - 20 October 1958. Cockpit wreckage - 20 October 1958. 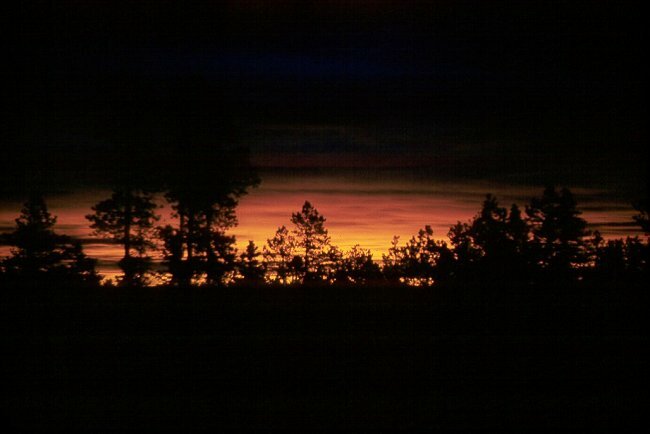 Sunset over the crash scene - 20 October 1958. 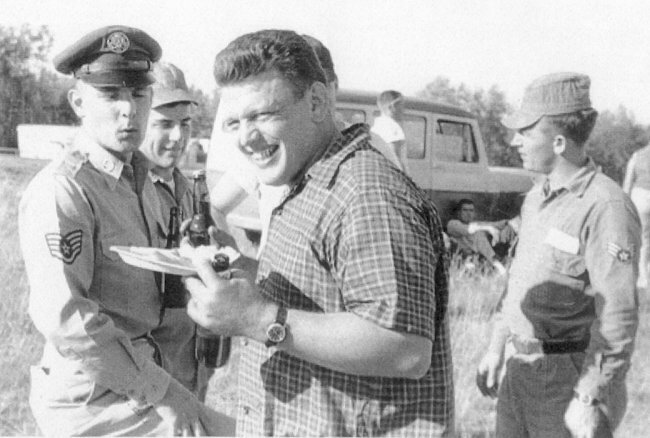 Captain Varnes chatting with the guys - July 1958. 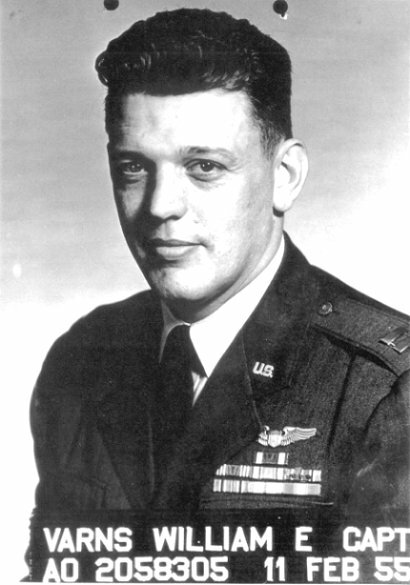 Official USAF photo of Captain William Varns - 11 February 1955.